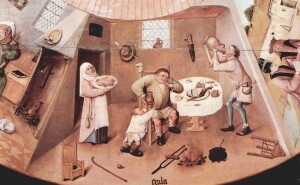 I have been thinking about gluttony: the holidays have that effect on me. So much good food. So much ill health. So much cause for celebration, but so many questions about celebrating well. It would be good if I could lose some weight in the new year, also so that I could be a better father: more energetic, stronger for the things my family needs me to be stronger for. Even more, I’d like to be holier in the new year. My wife brought up recently that we can use fasting to celebrate, too. Traditionally the day before big feasts was a fast. It wouldn’t kill us to fast now and then – in fact, it might make us healthier. And it would be nice if we had some way to mark solemnities other than adding to our girth. The first thing to say about our relationship with food, of course, is that it’s not that big of a deal. It’s the least big deal of all the vices: unlike pride, envy, wrath, sloth, lust, and even greed, a disordered relationship with food doesn’t directly hurt other people. The second thing is that there are serious issues of health involved. Our culture is pretty screwed up in its pursuit of a svelt body: but the truth is, I’m overweight, and it isn’t good for me, on any level. But the third thing is that spiritual things matter more than the size of my belly. The real question is not about diet, but about gluttony: disordered desires, that affect my love of God and neighbor, continue to read more, what follows can save your life. Maybe a helpful way to approach the question is in terms of fear of the Lord. Yes, “perfect love casts out all fear” (1 John 4:18). But on the other hand, fear of the Lord is a near-constant theme in Scripture, including in the New Testament and even the words of Jesus: “fear not them which kill the body, but are not able to kill the soul; rather fear him who is able to destroy both soul and body in hell” (Matt. 10:28). Jesus goes on immediately after that to say, “fear not therefore, you are of more value than many sparrows” (Matt. 10:31). The first thing to say about fear and the spiritual life, then, must be that there are many kinds of fear: good and bad; fear of God, fear of other things; different kind, even, of fear of God. Augustine worked out some important ideas about fear of the Lord in his commentary on that line we just saw from First John, and the tradition has really run with those ideas as very useful. In short, he says we can fear that God will get in the way of our delight, by preventing us from having fun; this is a spiritually destructive kind of fear. But we can also fear God’s punishment: and just as God’s punishment is there to help us move toward God, so too fear of that punishment can help us grow in the spiritual life. Fear of punishment is a spiritually productive thing. But not a perfect thing. The highest, best kind of fear, says Augustine, is the fear of wounding our relationship: the delicacy of lovers, or of child and parent. I would never want to do anything to hurt the ones I love, and that makes for an entirely different kind of fear, fear that is not cast out but increased by love. This is a helpful way to think about gluttony. On the one hand, yes, it’s true, God doesn’t “care” if I have another Christmas cookie: anyway, there’s no law against this cookie. On the other hand, I want to grow ever more sensitive, ever more delicate about my relationship with God. I want to think about him more, not less. It is not good for our spiritual life – indeed, it is one of the worst things of all – to spend life naming what God doesn’t care about, what doesn’t matter. The Psalms often repeat, “the wicked . . . has said in his heart, God has forgotten; God hides his face; God will never see it” (e.g. Ps. 11:11). The struggle with gluttony is not about absolute right and wrong. It is about spiritual sensitivity, fear of the Lord, trying to live ever more in the presence of God. We should never think, “God hates this cookie.” But we should fight strenuously against the thought, “God doesn’t care.” God does care: he cares about our relationship. Let us use the struggle with gluttony to struggle to do what is best: what celebrates best, what best serves the people around us, what can best unite us to God, what can best serve our long-term interests. And never say God doesn’t care. Do you find yourself approaching food with an attitude of mediocrity: it doesn’t matter, God doesn’t care? How could you grow in your relationship with God through food?